With the rise of artists like Iyanya, WizKid and Davido, Nigeria’s worldly rhythms are finally making their way to a global stage. Earlier this year, Michelle Williams released a gospel single featuring her former Destiny's Child groupmates Beyoncé and Kelly Rowland. The song, produced by Harmony Samuels (the man behind Ariana Grande's "The Way"), was driven by a lilting uptempo beat and a peppy chorus. By the end of June, it leapt to the top of Billboard's Hot Gospel Songs. Its accompanying video has over 7 million views. Samuels—born in the UK in 1980 to Nigerian parents—told Billboard last month that "Say Yes" was a tribute to his Nigerian roots. The song's melody is based on a traditional Nigerian hymn, "When Jesus Say Yes," a song passed down through generations of African Christians. "Say Yes" also reveals its Nigerian origins in the song's galloping beat, which has an underlying pulse reminiscent of house music, but never quite straightens into a standard four-on-the-floor groove. Michelle Williams' version of the song doesn't feel like an especially radical record—if anything, its folk origins, religious content, and cheery mood are quaintly traditional. Musically, it's a somewhat simple, even diluted approximation of its inspirations. But in looking to Nigeria, "Say Yes" signals a likely future for popular music, both internationally and in the United States. For years, America's mainstream has experienced African music as an exotic flavor, sold through "World Music" compilations and in collaborations with Western artists, as on Paul Simon's Graceland. But a new generation of African artists has emerged, many of them centered around Nigeria. These performers are not merely interpreting Western styles for a modern African audience, nor is the music disengaged from popular music worldwide. Instead, these performers are leading popular music in a new, vital direction. In most of sub-Saharan Africa, singers, rappers, and charismatic pop stars like WizKid, Davido, Sean Tizzle, D'Banj, P-Square, and Iyanya are as popular as international artists like Chris Brown or Rihanna. Picking up on trends from the U.S., Jamaica, and Trinidad, they reimagine diasporic influences and—more often than not—completely reinvent them. Crucially, listening to a cross-section of Nigerian performers, it's not difficult to imagine their music succeeding within the United States. Songs like Sean Tizzle's "Mama Eh" or WizKid's "Show You the Money" have a strong populist appeal, often weaving in English lyrics and hooky melodies that don't sound far afield from American pop. But these artists are not merely performing an "exotic" flavor of Western hits. Rhythmically, Nigeria's scene is leagues more advanced than its American counterpart. It's especially evident on the essential compilation This Is Africa: Yoruba Hits 2013-2014. Standing at the intersection of EDM, R&B, and hip-hop, Nigeria's intricate beats offer a 'way out' of the increasingly constrained possibilities of traditional genres. Nigeria's rise makes sense, considering the country's size and history. The CIA estimates its population at around 177 million, making it Africa's most populous nation. But it's only been in the past 15 years that Nigeria has really arrived on the national stage. In 1999, three decades of military rule came to an end with the election of Olusegun Obasanjo. And just this year, buoyed by its considerable oil wealth, Nigeria's GDP surpassed South Africa's to become the largest on the continent. Its struggles with violence have been widely reported, as conflicts continue to flare between its largely Muslim North and Western populations and its predominantly Christian South and coastal people. (To this day, the U.S. government recommends travelers avoid Nigeria's Adamawa, Borno, and Yobe states.) Other recent news—from kidnapped schoolchildren to a nearby Ebola breakout—paints a bleak portrait of the emergent nation. But less widely covered is the country's rich culture, including a long legacy of musical innovation—and one of the most highly developed, professionalized entertainment industries in the world. Standing at the intersection of EDM, R&B, and hip-hop, Nigeria's intricate beats offer a 'way out' of the increasingly constrained possibilities of traditional genres. Since the beginning of the 20th century, rhythm has been the driving force of Western pop music: from jazz to rock, Chuck Berry to James Brown, the evolution of the beat has been at the forefront. Much in the way that Timbaland shifted the sound of late '90s R&B—breaking down hip-hop drums to their component parts, liberating the kick and snare from predictable funk break patterns—Nigeria's new style seems set to revolutionize today's staid templates. For popular R&B, torn between hip-hop production and EDM for nearly six years, Nigeria's sound would seem a logical next step. It also suggests an opportunity for increasingly retro-minded dance producers, who will find Nigeria's beatmakers easily subsume EDM's signatures within their own sound. Nigerian-American promoter Niyi "DJ 3K" Panaki is the co-founder of the Hottest Coalition of Nigerian DJs, and throws Chicago's regular Afro-Fusion parties along with his brother, Dayo "DJ Dee Money" Panaki. He sees rhythm's primacy as the real source of the music's energy. "A lot of [American] music, they have the kicks and all that stuff in there," he says. "But the melodies overshadow the kicks. African music is all about that boom. Boom. Boom." Where a genre like reggaeton centers around a specific, identifiable groove, Nigeria's artists invert that dynamic. In a sense, Nigerian Afropop is identifiable for what it isn't rather than for what it is. The rhythms are often far too variable and complex to be labeled house music, although they often share that genre's dance tempo and propulsive momentum. Though the records can be counted in 4/4 time—the standard Western signature—they are often organized around what, in Afro-Cuban music, is called a clave. The clave is rhythmic pattern that originates in West Africa, an underlying 3-2 or 2-3 pulse that operates as a cross-rhythm with the regular 4/4 beat, inviting a multitude of possible interpretations for the dancer. That Afropop refuses to focus for more than a moment on a single rhythmic template is a virtue. The more complex rhythms can seem difficult to grasp at first. But ultimately, this music is designed to broaden the dancer's possibilities, with each kinetic groove competing to be more compulsive than the last. Listening to a straight-ahead retro house record can seem banal after immersing yourself in the sound of Afropop. In comparison, Nigerian songs offer a considerably more nuanced dance experience. Like the way Banky W's "Jasi" manages to feel jaunty and slinky at once. Or how Orezi's "You Garrit" springs back and forth with the urgency of a game of hot potato. Although the rhythms are intricate, the drums are quantized—the method by which beats are electronically "corrected" to remove human imprecision—to ensure ease of mixing for DJs. "It's kind of like taking the Talking drum and putting it into electronics," explains DJ 3K, referring to the traditional West African method of percussive communication common to the Yoruba people. "And using that, plus the bongos, and all that other stuff, and trying to make it more modern, for people to understand, for people to feel it a little better." Of course, it's not just these particular rhythms that make this sound so exciting. Much like hip-hop or dancehall, Nigerian music brings a wealth of new star personalities to the forefront. And the breadth of sounds incorporated by these artists only magnifies their larger-than-life presence. Ghana's Azonto scene has a relatively specific sound, and South African Afro-house, subverts, but retains loyalty to house music's core characteristics. In contrast, Nigeria looks the world over for ideas and inspiration. Artists like Phyno rap in a style reminiscent of American hip-hop artists, and many Nigerian artists' videos reflect the massive mansions and flashy cars familiar to hip-hop fans. May D's "All Over You", on the other hand, might remind American listeners of soca artists like Kevin Lyttle or Rupee. And an underlying orientation towards house grooves in Nigerian music's DNA shows the influence of South Africa's long-flourishing Afro-house scene: Naiji pop star Davido's 2014 smash "Tchelete" is a collaboration with South African Afro-house group Mafikizolo. Some artists play with Jamaican history: Burnaboy's "Don Gorgon" swipes the costume of early '90s dancehall like Supercat, but bends it into a completely new shape. Patoranking, on the other hand—whose "Girlie O (Remix)" has been a Nigerian smash—is generally considered a dancehall artist. Nigerian Afropop artist 2Face had a hit in Jamaica with "African Queen" in 2006. And Jamaican artist Busy Signal has recorded a version of P-Square's "Personally" retitled "Professionally." For those not paying close attention, Nigeria's relationship with Jamaican music is pretty tangled, although the underlying pulse of South African house inside the former might be one way to differentiate the two genres. But it's not just about the beat: "If a Jamaican producer produces a beat for a Nigerian artist, and a Nigerian artist sings over that beat, you would think it was Nigerian music," says DJ 3K. "Same goes for if a Jamaican sings over a Nigerian beat...there are some similarities. But they are different." It's not just an increasingly intricate rhythmic bed that Nigeria injects into the diasporic genres of hip-hop, R&B, dancehall, and soca. It's also an omnivorous pop sensibility, uniting disparate ingredients into a vibrant creative soup—a characteristic it shares with dancehall and hip-hop from around the turn of the millennium. These songs tend to lunge for the pop jugular. In addition to huge, immediate hooks, populist tools of Nigerian artists include viral dances, like Davido's incredible "Skelewu," or the latest contender, MC Galaxy's "Sekem." "Dorobucci"—one of this summer's biggest anthems—took a new, social media-driven route to ubiquity. "Don Jazzy was a good promoter of that song," explains DJ 3K. "On his Instagram he gave a little taste, and just told people to sing it. On Instagram, everybody was singing Dorobucci, and he dropped the record—now everybody's singing Dorobucci. Before you hear the song, you know the song." In the UK, Nigerian music has been lumped together with other sounds of Sub-Saharan Africa into a style called Afrobeats. A few scattered trendpieces have charted the form's rise from a UK perspective, although DJ 3K sees "Afrobeats" as more of a contemporary marketing category than anything else. "I think it was by mistake that they just labeled it Afrobeats," he says. "If you ask somebody else who grew up in the Afrobeats scene, 'What is Afrobeats?' they will tell you it's Fela [Kuti], and he created that genre. But when you listen to it, it's a little different from what the modern African musicians are doing. It's easier in the UK to do it that way because they're trying to label it in a genre and stick everybody in that one pot." 3K sees the modern Nigerian sound's roots in the success of an early '90s duo called Junior & Pretty. "The beat was still a pop beat, but they were rapping in pidgen English, and people loved it," he says. "And they came out with this album [1991's Fufu Flavour], and everybody liked the way it flowed—it was just nice and smooth. People were dancing to it at parties." Soon, DJ Jimmy Jatt, a Lagos-born DJ, helped foster the country's hip-hop scene, congregating University students to record over American hip-hop instrumentals. After that came the R&B trio of Faze, 2Face, and Blackface Naija, known collectively as the Plantashun Boyz. (The group broke up in 2004 to launch solo careers.) "Then you have eLDee, Trybesmen, Freestyle. A couple of other people. In that era, that's when it started molding, started changing into what it is now." Although Afropop doesn't have a mainstream presence in North America, its artists have continued to tour in the States, primarily for immigrant audiences. One such performer is Nigerian superstar Iyanya [main photo], who's released two albums (2009's My Story and 2013's Iyanya vs. Desire). This July, he headlined a show at the Shrine in Chicago, a 600-capacity venue in the city's South Loop, for a modest audience largely made up of African immigrants and first generation African-Americans. After an opening set by fellow Nigerian Tekno, the muscular star prowled the stage and flirted with women in the audience, his performance rehearsed to perfection. 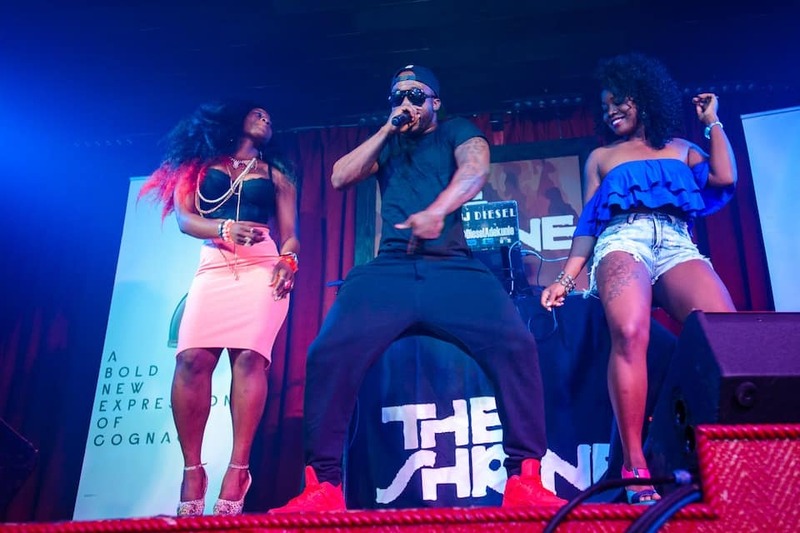 Standing shirtless and covered in sweat in The Shrine's small dressing room after the show, Iyanya listed a handful of the different places in North America he's performed over the course of the past two years: "New York, Minnesota, Calgary, Boston, ATL. Houston. Dallas. Indianapolis." To Iyanya—perhaps unsurprisingly, coming from a vocalist—it's not just the beats that define the African sound: "Our melodies are different. Once you hear it, it has to be African. And we also try as much as possible to make sure our culture, our personalities, our rhythm, our sound is represented in every song." His chief inspirations will be familiar to American readers. "Michael Jackson, definitely. Thriller. Bad. I grew up watching all of that." He pauses and sings: "'...out of my dreams. Billy Ocean! My dad used to play a lot of Billy Ocean. The good thing about Americans is every time they're selling an artist to the world, they use their concerts. So they show you how the artist performs. So you don't just hear the CD. Sometimes you know him, because you just watched the concert live. That really inspired me. R. Kelly too, with "I Wish," "The Storm Is Over," "I Believe I Can Fly"—everybody grew up singing those songs." Iyanya's career route shows the level of business savvy in Nigeria's contemporary industry. In fact, his story doesn't sound too far off from the path taken by similar artists in the U.S. He first made his name in 2008, winning MTN's Project Fame West Africa competition. Since that time, he's built up his reputation with the release of successful singles and albums, sold through iTunes, and performances, both throughout Africa and overseas in the States. (DJ 3K estimates that a successful Nigerian pop artist is likely to make anywhere from five to 20 million Naira per show in Nigeria—roughly $30,000 to $120,000. Other websites pegged the number between 5 and 10 million last year.) But the real money? "Right now, for the big big bucks, it'll be endorsements," says Iyanya. "Then it comes in bulk. Big fat checks." His advice to prospective stars following in his wake is similarly practical. "The only thing you need for sure is management. It's one thing to have talent. It's another thing to have someone else that knows how to sell that talent." The infrastructure of support for artists like Iyanya in the United States is, naturally, reliant on a network of Nigerian-American immigrants. In Chicago, DJ 3K and his brother Dee Money have brought numerous artists to the city, and the Hottest Coalition DJ crew they founded has spread throughout the country, where Nigeria's biggest stars have performed. This past Saturday, WizKid performed at Irving Plaza in New York City. And this coming Saturday, one week later, his biggest rival for superstardom, Davido, will be headlining Africa Summer Jam at Manhattan's Grand Ballroom. Hottest Coalition DJ Incognito will be among the openers. As for what it will take for a Nigerian star to truly cross over, DJ 3K suggests that in the United States it's merely a matter of getting the right people to push the biggest songs to radio. "The same way they're doing it in London," he says, referring to the chart success of numerous Nigerian artists across the Atlantic. "Once people get it into the radio stations, it's going to blow. To me, I think it's going to surpass reggae music [in the States]." Rumors are a Rihanna/WizKid song is in the works, although it remains to be seen if it's a genuine Afropop record, or simply another D'Banj/Kanye-style attempt to sell an African star over a more generic American groove. To date, only that Michelle Williams gospel record has been brave enough to take that next step. Although to DJ 3K, it's more like a baby step. When asked about the Nigerian response to the record, he chuckles. "The people I know, they don't really think Michelle Williams did it justice," he says, recalling its roots as a folk hymn. "They prefer to sing the song themselves." Catch Davido headlining Africa Summer Jam this Saturday in New York.